It has been unseasonably warm in Melbourne this week so Mark and I have been spending some time on the terrace. I consider the terrace another room of our apartment – an outdoor one without a roof. Because this “room” does get so hot in summer (Melbourne can be horrific in summer), the only plants that survive are cacti, olive trees, citrus trees and the succulents (though when the heat is extreme, I bring them in the house for some respite as their leaves sizzle in the direct 40 degree sun). These warm autumn nights have been perfect for sitting on the terrace, nursing a glass of chilled wine and chatting about our day at work. And of course, eating a spuntino whilst we sip our drinks. I love savoury dishes that have hints of sweetness. These cauliflower polpette are a delicious vegetarian appetiser, with soft currants, pine nuts and lots of parmigiano cheese. The cauliflower is cooked twice (boiled and then sautéed) before it is mashed to make into fritters which are pan fried. You can make them gluten free (or not) depending on what you have in the pantry or any food intolerances – they work equally well with or without gluten containing ingredients. The inside of the fritters is soft and so very tasty – children love them as does the most dedicated carnivore! They can be eaten warm or room temperature and are best eaten on the day they are made. A reminder about the Instagram competition that I am running. By posting a photo that captures “food, love, friends, Italy” you will be in the running to win “The cookery school of love”, the latest novel by NZ based Nicky Pellegrino. It is a fun read about 4 women who go to a cooking school in Sicily. You have until 12 April 2014 to join in the fun. The link for more details is here. Boil some salted water in a large pot and add the cauliflower florets until fork tender (mine took just under 10 minutes). Drain. In a large saucepan, heat some olive oil and saute’ the onion for around 7 miutes, until softened and starting to caramelise. Increase the heat and add the cauliflower florets, the pine nuts and the drained currants. Cook for around 5 minutes, stirring frequently then reduce the heat and mash the cauliflower with a fork as you cook. Season with salt and pepper and cook for another 7 minutes approximately. Remove form the heat and allow to cool completely. In a large bowl, place the cooled cauliflower mixture, the cheese, parsley leaves and egg. Add a tablespoon of breadcrumbs at a time, mixing as you go, until the mixture holds together. You should aim to add just enough breadcrumbs so that the fritters stay together when you cook them. Roll individual balls in flour and flatten them slightly. Pan fry in medium-hot olive oil for a few minutes on each side until golden. Drain on absorbent paper and serve warm or at room temperature. Cauliflower is so versatile, so many ways to enjoy it. Your fritters look yummy.. Thanks they are very yummy – or so my family thinks! Those look so delicious. Perfect for an autumn evening on a terrace! thanks Michelle, since I posted this the weather has turned cooler – I think they would be fine for a cool evening inside as well! Very nice. I normally avoid anything to do with cauliflower, but this recipe actually temps me. Thanks for sharing! We are going to a brunch on Sunday and I think these will be perfect! Thank you!! 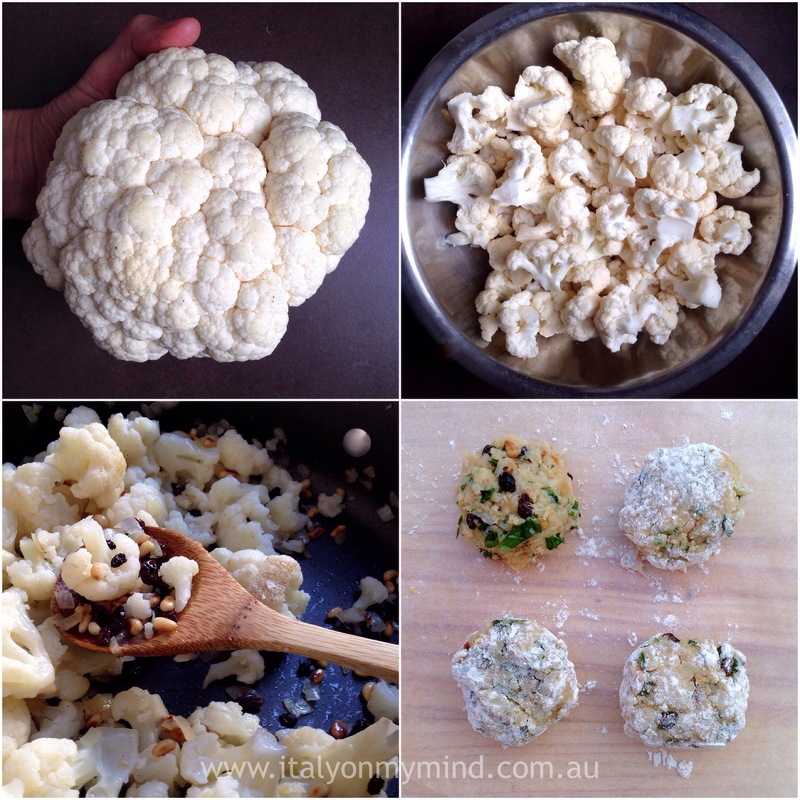 I love the versatility of cauliflower and would have to be one of the most underrated veg. I have made Rosa Mitchell’s cauliflower fritters and they are divine. Simply perfect.